He waited, watching her like a hawk (= watching her very closely). From Middle English hauke, hauk, hawke, havek, from 古期英語 hafoc, heafoc, from Proto-Germanic *habukaz (compare West Frisian hauk, German Low German Haavke, Dutch havik, German Habicht, Norwegian hauk, Faroese heykur, Icelandic haukur), from Proto-Indo-European *kopuǵos (compare Latin capys, capus (“bird of prey”), Albanian gabonjë, shkabë (“eagle”), Russian ко́бец (kóbec, “falcon”), Polish kobuz (“Eurasian Hobby”)), perhaps ultimately derived from *keh₂p- (“seize”). A diurnal predatory bird of the family Accipitridae, smaller than an eagle. A hawk by nature, Ellenborough strongly favoured presenting St Petersburg with an ultimatum warning that any further incursions into Persia would be regarded as a hostile act. (game theory) An uncooperative or purely-selfish participant in an exchange or game, especially when untrusting, acquisitive or treacherous. Refers specifically to the Prisoner's Dilemma, alias the Hawk-Dove game. (transitive) To hunt with a hawk. He rode astride while hawking; she falconed in the ladylike position of sidesaddle. (intransitive) To make an attack while on the wing; to soar and strike like a hawk. 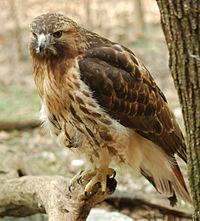 A falcon, towering in her pride of place, / Was by a mousing owl hawked at and killed. Uncertain origin; perhaps from Middle English hache (“battle-axe”), or from a variant use of the above. (transitive) To sell; to offer for sale by outcry in the street; to carry (merchandise) about from place to place for sale; to peddle. A noisy effort to force up phlegm from the throat. (transitive, intransitive) To cough up something from one's throat. He hawked up, with incredible straining, the interjection ah! He had a new tough manner of pulling down breath and hawking into the street. (transitive, intransitive) To try to cough up something from one's throat; to clear the throat loudly.